Seriously. They're too tall, you can't trust them. Fun to paint the limbs, but the leaves are unspeakably bothersome. 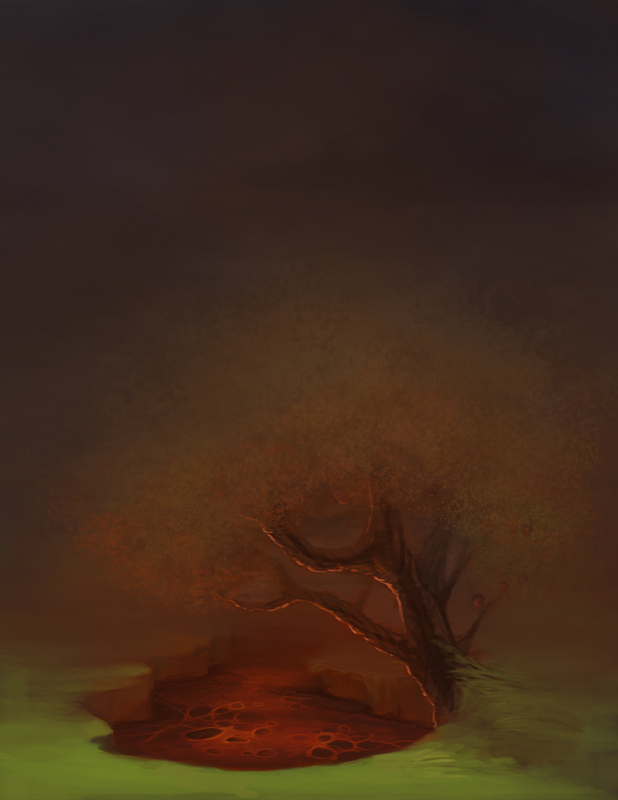 Felt like reattempting the environment of a painting I did a couple years ago, as a speed paint. It was supposed to be the tree of knowledge, hanging over a pit of lava. I haven't really looked at the old painting yet for comparison's sake - I hope it's at least a bit of an improvement. On that note, I'm considering moving onto the next entry (number four) of the biblical series I've been doing since I started college. I generally did one a year, and I did start on one last year, but grew disenchanted with it before I was able to finish. Not completely sure if I'll pick up where I left off, but I've been reading wikipedia articles on biblical myth again lately. Samael and Lilith are definitely quite inspiring.